In the 18th century, India's share of the world economy was as large as Europe's. By 1947, after two centuries of British rule, it had decreased six-fold. Beyond conquest and deception, the Empire blew rebels from cannons, massacred unarmed protesters, entrenched institutionalized racism, and caused millions to die from starvation. 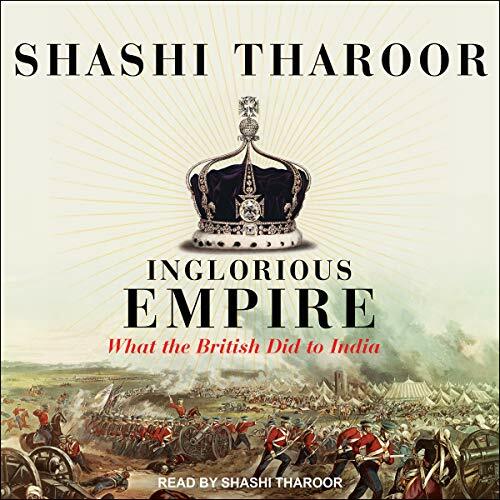 British imperialism justified itself as enlightened despotism for the benefit of the governed, but Shashi Tharoor takes on and demolishes this position, demonstrating how every supposed imperial "gift" - from the railways to the rule of law - was designed in Britain's interests alone. He goes on to show how Britain's Industrial Revolution was founded on India's deindustrialization and the destruction of its textile industry. The author have very good argument against the colonial past. I am overwhelmed with facts but to an extend sound like fiction as well. Very well narrated with dynamic voice of the author. I wonder if this book will produce anything positive or constructive. I feel The narrative of this book is falling into the category of rising popular ism. I believe this book will produce more ultra-nationalism fanaticism and some friction among nations especially between Britain and India. Every child in ex-colinies should read this book. this boojs should be made part of academic curriculum. a good narrative and lots of information about ways of the inglorious empire, and there total disregard for basic humanity when it came to the needs of the masses. Loved it, basically, all the things I found wrong with my people are a result of the British. haha, just kidding, but this gives great insight to the story of India and how the British only set us back, we are determined to change the world. and Tea isn't Indian... WTF!! one of the best from Shashi Tharoor! liked the narration, presentation of facts and a calculated, critical assessment of British Raj in India.